The Easy Way to Professional Results & Picture Perfect Food Prep. Cut your food faster than ever, and achieve perfect results at the same time. This is currently the mid range model V-Slicer, but we also carry the Original V-Slicer, and the new and improved V-Power Mandoline. The model featured on this page is referred to as the Pro, and it features many improvements over the original version, but is not quite as advanced as the V-Power. All models of the Borner V-Slicer feature high quality construction and super sharp blades so they are all incredibly easy-to-use and will allow anyone to generate professional results with each and every use. The V-Slicer Pro has three thickness settings along with a zero setting so the blade can be locked flush for storage. Simply adjust any of the inserts to your desired slot for thick, thin and medium cuts. Larger rubber feet at the base of the slicer means that it will be more sturdy on your counter, and will not shift around while your slicing. The V-Slicer Pro also has a slightly different design featuring and easier to hold handle, and looks a bit sleeker and more streamlined when compared to the original version. This model includes the Rocket Insert Holder to store all of your inserts as well as allow them to drip dry after washing. You also get two cutting inserts which are identicle in size to all other models, 3.5mm and 7mm. This amazing kitchen gadget can slice, dice, cube, shred and julienne. It will produce perfect, uniform results with every use, so anyone will be able to look like a pro when using it. This is one of the easiest tools of its kind to use, and it will outperform similar devices that are double the cost. You will find many uses for this versatile food slicer, and will end up impressing friends and relatives with your professional looking food prep, garnishes and dishes. It will cut faster and better than most other similar devices, and creates uniform results that are almost impossible to achieve by hand. The three included inserts will allow you to make ten different varieties of cuts and are adjustable to three different thickness levels. It comes with a thickness insert for slicing, and two sizes of blade inserts for chopping, dicing, shredding, and to julienne. Each insert has four notches, so you can do a thin, medium and thick version of every single cut, along with the child-proof zero setting for safety and storage purposes. The ambidextrous safety food holder has a serrated edge to safely push food off the slicer, requires very little pressure and with a quick 90-degree rotation, can produce a variety of different cuts. Steel pins inside the holder grip most any size or shape of produce to create even slices every time. The insert holder makes it easy to keep everything together and can even act as a drying rack when you clean your slicer after use. Stop slicing your fruits and vegetables by hand. Do it faster, easier and safer with the V-Slicer Pro. This is an inexpensive alternative to a professional stainless-steel mandoline, but will often be more simple to operate and will achieve the same results. You will be able to cut your food preparation time, and create elegant meals in less time with this versatile slicing tool. Superior construction and specially designed, razor sharp blades make this slicer easy to use. With it's unique design and multiple cutting inserts, you get perfect slices, dices and chops every time. Any fruit or vegetable is cut with little effort and you get the benefit of perfectly uniform pieces of food that look like they were prepared by a professional. Slice onions and oranges with perfect, uniform results, or use one of the blade inserts to perform a julienne cut or chop fruits and vegetables into cubes. It can neatly dice potatoes, tomatoes, and onions in several sizes or cut shoestring french fries, carrot sticks, cheese sticks and more. Cut thick slices of apple for pies and other deserts, or tomatoes for sandwiches and burgers. Slice up some potatoes very thin for homemade chips, or a little bit thicker to bake in the oven or cook on the grill. You can even shred cabbage or lettuce for cole slaw and salads. It is great for layered casseroles and side dishes, chopped salads or beautiful garnishes. Create Asian-style vegetable dishes, vegetable sticks for a dip tray, or just enhance everyday meals with this safe and efficient food slicer. To use the V Slicer Pro, you simply slide your selected insert into the V-Frame as it locks in place with a click. On the Julienne inserts, the metal blades will face outwards or towards the V-Frame blade. Select either the large or small blade to julienne, shred, chop and dice. With neither julienne insert installed you can perform a regular slice. Adjust the V-Slicer Pro to your desired thickness by removing the insert and replacing it in a different notch or thickness level. Put your fruit or vegetable on the safety holder using the metal prongs, then simply slide the food back and forth for perfect, uniform slicing, dicing, chopping and julienne cuts. You’ll get precise, uniform results and it’s way more efficient than cutting by hand. Order Yours Today! 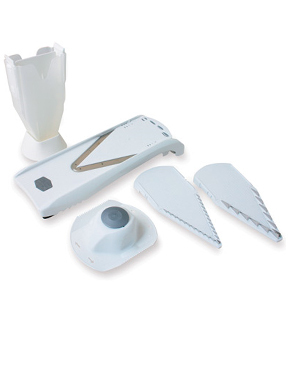 V-Slicer Pro - Get perfect, professional results every time with this high quality food slicer. With three thickness levels and three cutting inserts, it is an incredibly versatile machine. Cut your food faster than ever.. Order Your V Power Today. Will this V-Slicer Pro or the V-Power Mandoline still fit the bowl / catcher that used to be sold with the original V-Slicer? This used a notch on the underside of the V-Slicer to fit into the square hole near the handle of the bowl. This made it easy to catch the slices of food, which prevented it from scattering far and wide, and was also safer to use. Yes. The bowl is compatible with all versions, Plus, Pro and Power.